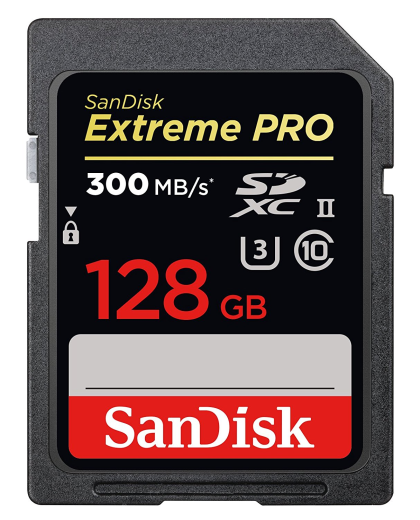 For super-fast continuous burst mode shots, maximum post-production workflow efficiency and high-performance video recording performance, get a SanDisk Extreme PRO SDHC or SDXC UHS-II card. The high-performance SDHC and SDXC memory cards boast shot speeds up to 260 MB/s (1733X) and transfer speeds up to 300 MB/s (2000X). Their sustained video capture of 30 MB/s (U3) supports 32 GB to 128 GB of full HD and cinema-quality 4K video recording. Optimized for cameras that support the UHS-II standard, SanDisk Extreme PRO SDHC and SDXC UHS-II cards deliver the uncompromising results that professional photographers demand.